American Forward David Atkinson (203-F-91) had a very impressive game in the last round for second-ranked Bima Perkasa, receiving a Interperformances Player of the Week award for round 20. 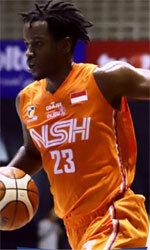 The 27-year old player had a double-double of 38 points and 14 rebounds, while his team beat Prawira (#5, 5-9) 78-71. Bima Perkasa is placed at 2nd position in their group in Indonesian IBL. They would have been even better if they hadn't lost a few games earlier this season. Bima Perkasa will need more victories to improve their 9-6 record. In the team's last game Atkinson had a remarkable 55.0% from 2-point range. He turned to be Bima Perkasa's top player in his first season with the team. Former Salem International University star has very solid stats this year. Atkinson is in league's top in points (2nd best: 28.4ppg) and averages impressive 2.7spg. The second best player in last round's games was 26-year old American Brachon Griffin (185-G-92, agency: SDJ Sports) of Prawira. Griffin had a very good evening with 32 points, 6 rebounds and 5 assists. Bad luck as Prawira lost that game 71-78 to the higher-ranked Bima Perkasa (#2, 9-6). Prawira managed to keep the same 5th spot in Red Group. His team is not often considered as one of the league's best with a mere 5-9 record. Griffin is a newcomer at Prawira, but is already one of team's top players. He belongs to the best scorers in the league with 20.1ppg (#8). His other stats are also decent: 6.3rpg and 6.5apg. Third on the list of top players last round was American forward Qarraan Calhoun (203-F-86) of Pacific Caesar (#3). Calhoun showcased his all-around game by recording 23 points, seven rebounds and six assists in the last round. He was a key player of Pacific Caesar, leading his team to a 81-74 win against #4 ranked Siliwangi in a game of the week. The chances of Pacific Caesar not to end season at such low position in White Group, however are less than slim as they have already lost 10 games, recording just six victories. With bigger assistance of his teammates, Calhoun could try to bring Pacific Caesar's a little bit higher in the standings. Calhoun has individually a great season in Indonesia. After 15 games, he made it on the list of the league's leaders in points with 20.0ppg (9th best) and rebounds with 11.8rpg (4th best). He also has 2.3bpg and FGP: 51.6%.